HX-MINI-WIFI controller appeared with the installation of controlling software on mobile devices with Android or IOS system, such as android phone, iPhone, tablet PCs, they can remote control LED lighting products through WiFi, which makes LED control more intelligent and humanization. One WIFI-MINI controller can be used as dimmer, CT controller, and RGB controller, only need to select the right control interface in the software. In addition, this model has DIY function. Users can get any effect they want based on our controlling software. This model designed for constant voltage led products, such as led strip, led modules. For controlling more led products, amplifier is available. 1.Support both wifi control of Apple products (iPod, iPad, iPhone), Android mobile devices like Samsung, HTC. 2.With the 3-in-1(Dimming, CT, RGB) apple/android software. One device suit to different lighting application scene. 3.Memory function to save scenes anytime anywhere for next play. 4.WIFI-MINI is designed for constant voltage led products, working voltage auto fit to DC12-24V. 5.Wifi control based on 2.4GHZ frequency. ●Android: the software copy in CD which packed in the box. Open the CD and double-click the "Freecolor.apk"to start the installation. ●IOS: the same as the other software from App Store download the "Freecolor" from App store and install. The initial default Username: admin, password: admin. And "OK". A. Select the "Security Mode": WPA2-PSK. 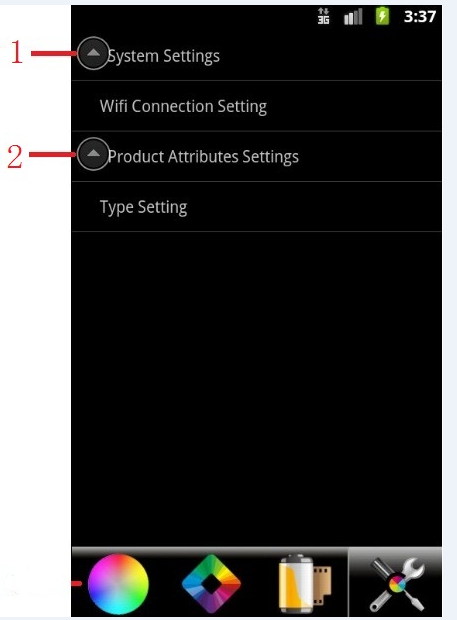 2) After step 1), open the WIFI setting interface on the device with WIFI function will find the WIFI which named "HX---", connect it. RESET key：Open the shell, there is a button,press and hold at least 5 seconds, WIFI previously set data will be cleared to return to the factory default. 2. Lead wire should be connected correctly according to grade that connecting diagram offers. Miswires may destroy the controller and LED products. 2. The controller does not work after connecting the load. The connection between controller and WIFI device may unnormal. Check the connection and try again. And make sure the compatibility between the software and the WIFI device. Reconnection or short down the distance between controller and the WIFI device.